Homepage. This page: What's the story behind this enamel badge? Anyone remember "The 30 Club" ?? I found two of these enamel car badges early in 2006, but sadly I've no idea what they represent, or who they refer to! 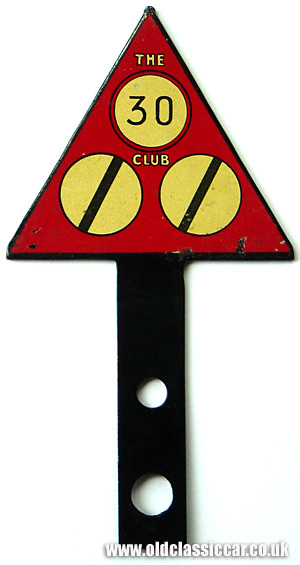 Was The 30 Club a scheme for road safety, perhaps to raise awareness of children or cyclists with the 1930s motorist?? both badges are identical, and measure approximately 6.5" in height. The black edging and rear may have been repainted at some time, I think they were originally chrome. Fortunately the design is original and un-messed with. I can't see any maker's stamp either. Judging by the style of writing, The 30 Club must have been around in the 1920s or 1930s - perhaps it coincided with the introduction of a national speed limit (hence the two national speedlimit signs on the badge), or a new 30mph limit for suburban roads?? all advice much appreciated - if you can help with id'ing this item, please drop me a line (see the contact page) and I'll update this page with any new info that turns up. Update 2007. Patrick Uden (producer of a few TV series about Classic vehicles in the 1990s) dropped me a line, and identifies the 30-Club as an organisation set up back in the 1930s for members of the press and media, and that is still around today. Thanks Patrick!